All theory can be done online/offline with our tablets. We try not to give any papers or books out. If you are interested in one of our courses, you can do your theory in advanced via e-Learning! For more information please click here! Every day (11.30 am) we offer a free half hour trial dive in our shallow lagoon with one of our staff. Have you always wondered what it is like to breathe underwater? The first time you breathe underwater is an experience to remember – and you will be surprised how much fun it is. Come and make some bubbles with us! The DSD (Discover Scuba Diving) is the first step to becoming a diver. During your first lesson you will begin by learning some easy skills in shallow water. Then off you go to your first real dive to a maximum depth of 12m. The duration of a DSD adventure is approximately 2 hours and there is no pre-qualification required. 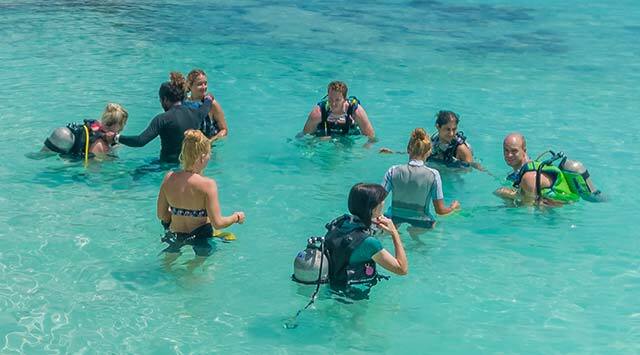 The Scuba Diver Course is the first part of the OWD (Open Water Diver) course and the first possible certification in diving that you can reach. It includes theory, confined water lesson and two open water dives. The required time is 1.5 days minimum. At the end of this course you can dive under the supervision of an instructor down to a depth of 12m. You can do an upgrade to the OWD anytime. e-Learning available – for more information please click here! The Open Water Course is the real key for a new experience in your life. It will take 3 to 4 days to complete and in this time you will learn all the necessary skills to dive down to a depth of max. 18m. At the end of this course you will be awarded with the Open Water Diver certification, that allows you to dive all over the world. The Referral OWD course is designed for beginners who completed the theory and confined water lesson at home and would like to finish the course somewhere else. After completion of the four open water dives you will reach the OWD level. This course will give you another view of diving. You will learn other techniques and skills in five different areas. These include deep diving, navigation, night, peak performance buoyancy, fish identification, naturalist and photography. The minimum requirement is to be at OWD level. Nitrox is like an airbag for a diver. The use of nitrox during a dive is to absorb less nitrogen. In this course we will explain the advantages of using nitrox and by the end you will be certified as a ‘Nitrox Diver’. The minimum requirement is to be at OWD level. We offer a wide range of Speciality Courses such as Scooter Diver (DPV), Search & Recovery, Shark Diver, Night Diver, Navigator, Deep Diver, Digital Under Water Photographer and many more. It’s possible to reach the Master Scuba Diver Level! For more information about these Specialities have a look on padi.com or divessi.com. If you are a PADI AOW Diver or equivalent, have experience and feel confident with your diving skills. You might be interested to know what to do and how to react if somebody around you has a problem? The course will take 3-4 days and consists of classroom presentations about how to be prepared, prevent, assess and act in order to manage a potential diving incident. It will be followed by practical training underwater as well as surface skills to help a diver in need. Let’s make some bubbles! For our youngest divers we offer the bubble maker program. We give a playful briefing and teach some easy skills, before the kids can dive with an instructor to a maximum depth of 2.5 meters. Let’s find Nemo, Dory and their friends at our house reef!